It’s no question that Designers Guild creates some of the most beautiful fabrics and wall coverings for the home. I am always intrigued by Tricia Guild’s bold and beautiful vision for home interiors. Flocked wallpaper, bright hues, an eclectic mix of bold patterns and textures, Designers Guild is a trove of beautifully designed furnishings and accessories. Perusing through a magazine, I came across one of their newest designs – bergamasque. 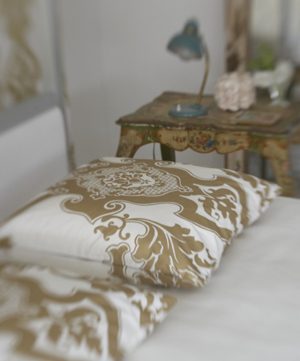 Inspired by Marie Antoinette, this design certainly has a royal feel to it. In gold, with a beautiful flourish, the baroque style is truly fit for a queen. 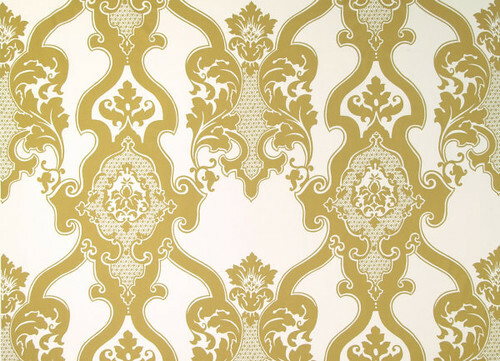 And in warm metallic tones, this damask print will add a cozy and sensual feel to any room in your home. You can also find bergamasque in black and duck egg blue right here. I want everything in that second photo. Designers Guild is my absolute favorite when it comes to color and pattern mixing! Just fantastic! I would love to have everything in that second photo too. If only that room could be mine! That is a lucious room – I would love to wake up in that one day! Hi Jeanine, My name is Chris and I am the Marketing Director at Designers Guild here in London. We are delighted that you love what we do and that you spread your enthusiasm via your superb blog. Much appreciated! We are currently in the process of launching our Autumn 08 collections which is exciting. We have also just launched the ‘Royal Collection’ which is really exciting. Check ity out on our website. Thanks again.BestChrisP.S. Love San Fran!! Hello Chris! I am so honored to have you visit the site. I will definitely check out the new Designers Guild catalogue for Fall. The Royal Collection looks absolutely beautiful. Thank you so much, and thank you for visiting AphroChic.